Addvild is a Nord farmer who works for Vulwulf Snow-Shod at Snow-Shod Farm with his recently married wife, Leonara Arius. 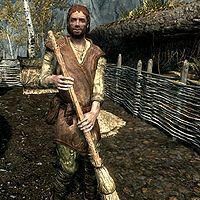 He appreciates honest work and will pay a septim each for leeks and potatoes and five septims each for wheat. He starts his day at 6am with a one-hour breakfast at the farm house. At 7am, he goes outside to tend the crops and look after the farm animals until his bedtime at midnight, taking a break at 7pm to dine at the house for one hour. Regarding his position, he is extremely appreciative of Vulwulf Snow-Shod for trusting him to take care of the farm without supervision. This is evident in his oft-repeated phrases "Vulwulf has been quite generous to let me take care of their farm considering I am not part of their family." and "The Snow-Shod's [sic] are very trusting to let me run this place without their supervision." However, he can also be heard saying "I'm glad there are guards outside the farm. I don't think I could defend the place alone." Although he is not a merchant and remarks that "If you're looking to purchase goods, I have none to sell. You should head into Riften instead. ", he will still buy leeks and potatoes for 1 coin each and wheat for 5 coins from you. These crops can all be found in a nearby field. He will also comment on his life on the farm: "Pretty quiet out here on the farm. My wife and I kind of like the solitude." If you have cleared out Aringoth's safe during the quest Loud and Clear and have not returned to Brynjolf, Addvild will express concern about the nearby estate: "Did you see the fires from Goldenglow Estate? I was afraid the whole place was going to burn to the ground!" He wears farm clothes and boots. He wields a leveled dagger in combat and carries a belted tunic along with common items and gold. Addvild: "My sweet Leanora [sic], I will never let anything happen to us. I promise." Addvild: "It will have to do. Besides, if it came to blows, I'm sure the Snow-Shod's [sic] would come out here and assist us." Esta página foi modificada pela última vez à(s) 12h04min de 29 de outubro de 2014.